Astronomers have spotted an object that they believe came from another star system. The 400-metre-wide object – dubbed A/2017 U1 – was first spotted on October 19 after it slingshotted around the Sun. Analysis of its trajectory suggests it passed beneath Earth's orbit by about 24 million kilometers on October 14. Whatever it is, it's moving: boffins have clocked it at 44 kilometers per second. Dr Karen Meech, an astronomer with the University of Hawaii, told The Register the object's orbit suggests it is not of this star system. Astro-boffins assign a perfectly circular orbit around the Sun an eccentricity of eccentricity of zero, while an extreme parabolic orbit has a value of one. This object has been given an eccentricity score of 1.2 – by far the largest ever seen – suggesting it isn't in heliocentric orbit at all but is instead just passing through. A/2017 U1 also came in on a very unusual path, arriving from well above the plane of the ecliptic and making a very sharp turn as it passed under the Sun. "We have been waiting for this day for decades," said Paul Chodas, manager of NASA's Center for Near-Earth Object Studies. "It's long been theorized that such objects exist – asteroids or comets moving around between the stars and occasionally passing through our solar system – but this is the first such detection. 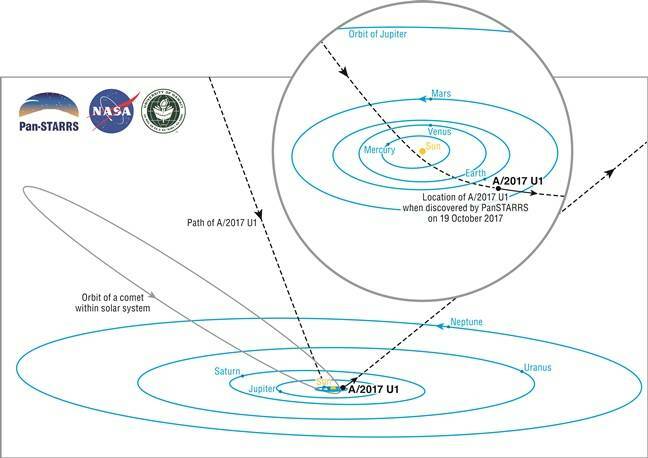 So far, everything indicates this is likely an interstellar object, but more data would help to confirm it." "Everyone is now scrambling to get telescope time to observe this object," Dr Meech said. "We have a three or four-week window in which it's bright enough to do real science on this." The problem is that A/2017 U1 isn't particularly big or bright, and the further it moves away from the Sun the harder it will be to see. If Hawaii's Thirty Meter Telescope was complete it would be ideal but construction has been held up after locals objected to the construction of another telescope on Big Island.